Decorated Soldier Ambushed in an Ontario Bar!! This is just makes me see red. Cowardly bastards. A soldier honoured for his military valour in Afghanistan is wondering why strangers beat him up in his hometown bar this past weekend. "This wasn't two guys on the ice dropping gloves and going, 'OK, let's go'," Master Cpl. Collin Fitzgerald told CTV Ottawa on Tuesday. "This was an attack -- a sneak attack. To blindside a guy ... and hit him with an object, there's something wrong." Fitzgerald is well known in Morrisburg, Ont., a small town about an hour's drive south of Ottawa.He says he'd been in the bar only about 20 minutes late Friday, visiting with a childhood friend who introduced him to people as a war hero, when he was suddenly struck from behind with some type of object. Four men jumped him and began beating on him. "They were saying 'What kind of hero are you now? '," Fitzgerald's mother Arlene told CTV News. "If it was true that they said that, then they're ignorant," Fitzgerald said. Bystanders pulled the attackers off Fitzgerald and his friends drove him to hospital.The weapons instructor at CFB Trenton had his foot broken in three places and needed 10 stitches to close a cut above his right eye. Fitzgerald, 27, also suffered a broken nose and two black eyes in the Friday night attack. "Whatever he hit me with, he could have easily taken out an eye," the soldier said. "What if he hit me in the throat? It could have been an artery." Fitzgerald is married, with a young family. Gov. Gen. Michaelle Jean recognized Fitzgerald in a Feb. 19 ceremony for braving enemy fire in Afghanistan.He served eight months there. 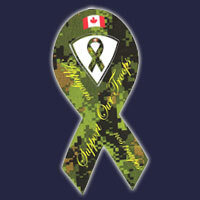 He was one of the first recipients of the Canadian Medal of Military Valour, "for outstanding selfless and valiant actions" carried out on May 24, 2006, during an enemy ambush "involving intense, accurate enemy fire." According to the military, Fitzgerald "repeatedly exposed himself to enemy fire by entering and re-entering a burning platoon vehicle and successfully driving it off the roadway, permitting the remaining vehicles trapped in the enemy zone to break free." "Collin was safer fighting the Taliban. At least he saw the enemy coming, or knew the enemy was there," said his mother. "They are just total cowards, nothing but snakes," said Gerald, Collin's father. Fitzgerald will need at least a month to recover from his injuries. Several of his army buddies are still recovering from injuries they suffered in Afghanistan. "They don't realize how good we have it here in Canada and what we're trying to help the Afghan people have," he said of his attackers.Ontario Provincial Police have arrested 21-year-old Travis Baldwin, a Morrisburg resident and hockey player, and charged him with aggravated assault. Back in the day when one of our soldiers was attacked and beaten up we would go down town and administer some justice to the perpetrators. I hope things haven't changed all that much at CFB Trenton.